You'll find a 16 GB card in the kit, which means you can start using the camera right out-of-the-box. The microSD card slot supports memory cards up to 128 GB. The display isn't touch responsive. Boasting a premium build quality, generous storage, and great camera clarity, the R100 can record tons of high-definition videos in 1296p and 1080p resolution. An excellent option for those who travel a lot. 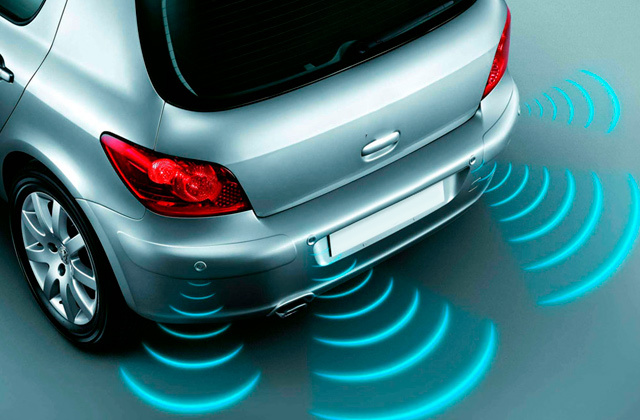 Packed with the Lane Departure Warning System (LDWS), the unit will deliver an audible alarm to alert you if your car is off track or veering into the adjacent lane. The G-sensor requires a thorough calibration. 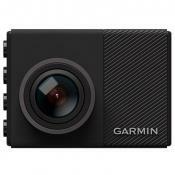 This camera records HD videos and is great for everyone, especially for those who often travel long distances alone. Having such an assistant at hand, you’ll never fall asleep when driving. The extra-large 7" LCD screen has a high resolution. So, you can watch recorded video files even without a need to transfer them to your computer. The installation over large rear-view mirrors might be a bit tricky. 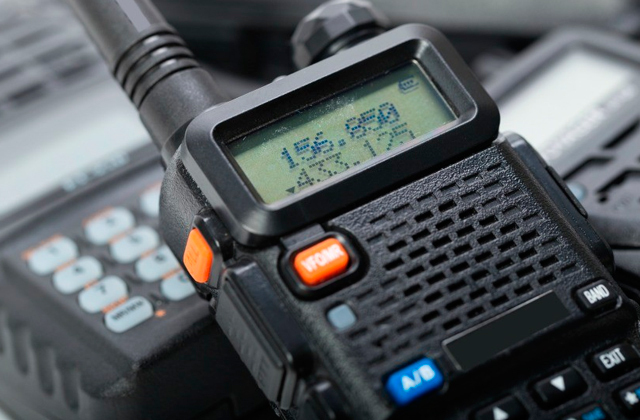 The Toguard CE35 boasts the best price/quality ratio. 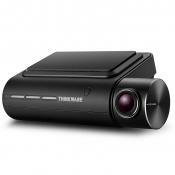 It can simultaneously record Full HD 1080P front view videos and 480P rear videos. Plus, it's stuffed with a plethora of other safety functions. The rear сamera can be mounted in two ways: with the double-sided tape only (included in the package) or with 2 screws. The latter method is more reliable. The rear camera has a poor viewing angle. 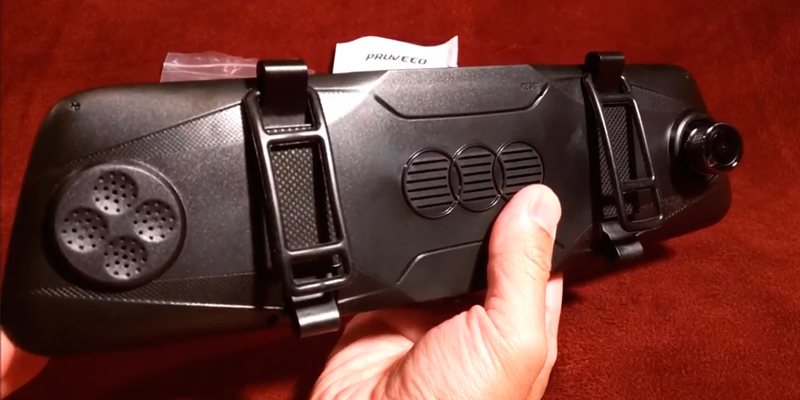 The Pruveeo D700 Dual Lens Mirror Cam is another budget-friendly model that has a large touchscreen and can record decent-quality front/rear videos. 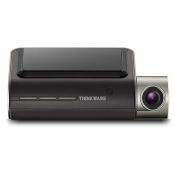 The camera is easy to use and install. The Ambient Light Sensor automatically adjusts the display brightness according to the intensity of the ambient light, delivering you a crystal-clear view. The display could be larger. 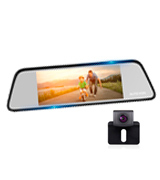 Although this unit has a front camera only, it stands out from others with its ability to rotate by 350 degrees, allowing it to capture everything, even what's happening inside your car. 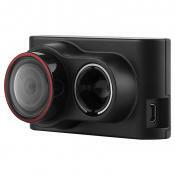 DLINKS dash cameras stand out from other models with a superior clarity and a myriad of valuable features. With a premium build and a high-quality display, the R100 boasts clear coverage and can completely replace your rear-view mirror. The thing is, it’s covered with a mirrored glass panel which works just like any normal mirror should. Its design is extremely clever and the camera is so inconspicuous that most people will not even notice it. It’s super slim and remains stealthy while providing you with additional protection from wrongful accusations for insurance purposes. The built-in 5-inch IPS screen is where the KDLINKS R100 excels. 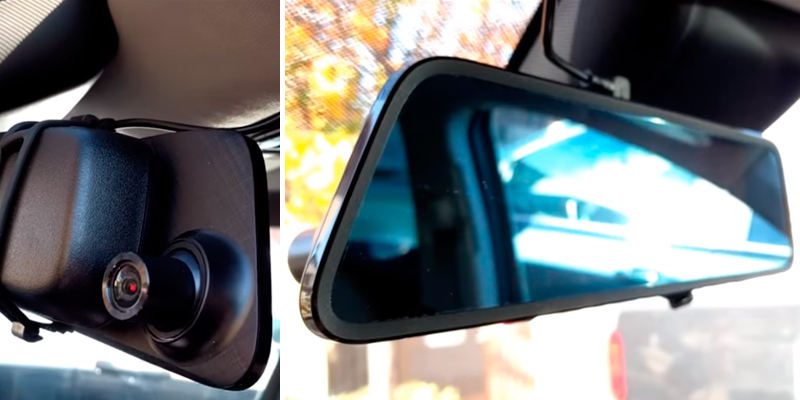 It’s located on the left side of the mirror, so the video does not interfere with driving. You’ll be able to shift your focus to the display and still see what will be happening around. It’s worth mentioning that this unit not only records the front but the rear as well. The front camera has an amazing 1296P resolution while the wide-angle rear camera records in 1080P for the full HD coverage. One of the great features is that you can always switch the display from “Front” to “Rear” or choose both “Front and Rear” by pushing the “Up” arrow at the bottom of the mirror. Both cameras provide excellent video quality and thanks to the 6-glass lens design and wide dynamic range (WDR), they give you high-definition videos both in the daytime and the nighttime. The Auto-off function is a unique addition allowing the R100 to automatically turn off the camera screen if it does not sense movement from thirty seconds up to five minutes (you can select in the menu). This way, you’ll be able to take the full advantage of the large rear-view mirror allowing you to capture more blind spots behind. Yet, the interesting features don’t end here. Keep on reading and discover more. This rear-view mirror dash cam also has the built-in 800mAh battery and G-Sensor, and just in case any strange movement is detected, it begins recording even when your vehicle is off. And this video file will be locked while other non-important videos will be automatically deleted over time due to the Loop recording feature. The Loop feature also means that you won’t need to waste your time deleting the SD card again and again. Right out-of-the-box, the unit comes with a 16GB micro SD card that works fine but can be easily replaced with 128GB one. 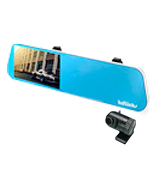 So, if you need a premium product to secure yourself and your vehicle, this is one of the best HD mirror cameras out there. 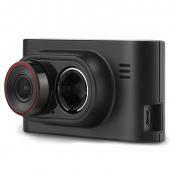 The AUTO-VOX M8 is a well-created combo of a dash camera and a rear camera. The main selling point is that it has an extra-large 6.8-inch LCD display sitting dead center in the mirror. The screen is bright and large enough to replace the mirror behind it. But it performs much more functions that a regular mirror. 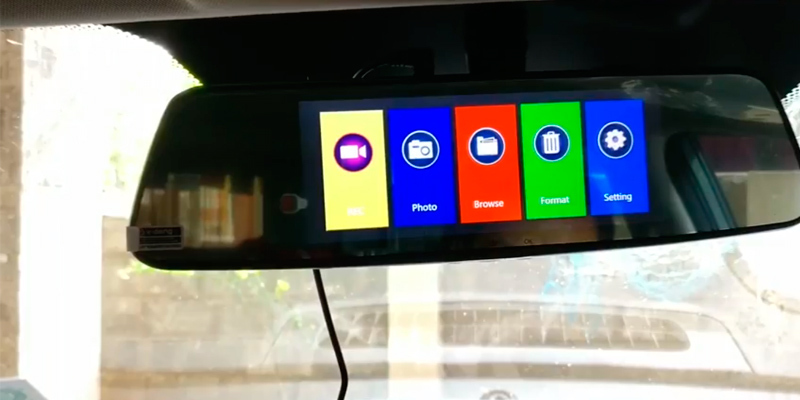 Using the intuitive touchscreen, you can playback recorded videos, switch between dash cam features, as well as watch a live feed from the front and reverse cameras. The standard overlay shows the storage used, recorded time, battery life, date, microphone status, and some other useful information on what’s going on. But if you want the full view of the mirror, you can power off the screen and the cameras will still keep rolling. 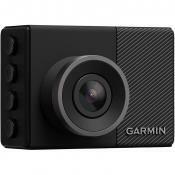 The front camera has a 140° wide-angle lens that captures a full view of the road. It’s capable of recording full HD 1296P videos in 1080P x 720P resolution. It boasts the super night vision to ensure a clear and smooth image 24/7. With a 6-glass lens and a sensitive image processor, it does capture all small and essential details. Additionally, the unit has one more camera that sits at the rear. 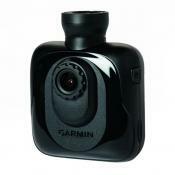 The rear camera has a 180° angle lens that provides a very comprehensive view for reversing. It’s IP68 water-resistant and will survive even a heavy rain. We really like how the AUTO-VOX M8 attaches to the existing rear-view mirror. It’s fitted with two bands that need to be pulled over your original mirror. In case you hear a rattling noise, you should just tighten the back straps. That’s it. 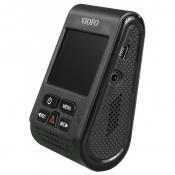 This recorder can become your reliable road assistant thanks to the numerous built-in safety features. 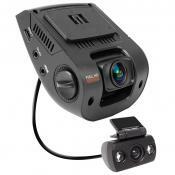 What sets it apart from other cameras is its Lane Departure Warning System (LDWS). You will hear a loud sound if you are off track or veering off into other lanes. 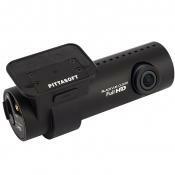 Another notable feature of this recorder is Motion detection which automatically enables the dash cam once the motion is detected within 9 feet of your car. 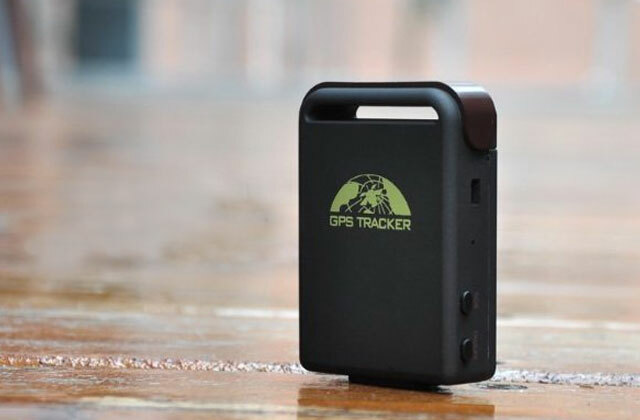 The backup battery will provide enough power to record any incident. And if don’t want to transfer recordings off your SD card too frequently, there is a Loop recording function that automatically deletes the old footage. 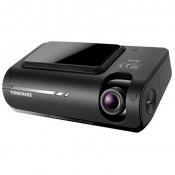 All things considered, we would definitely recommend this camera to all drivers, and especially so for those who often travel long distances alone. Having such an assistant at hand, you’ll never fall asleep on the road. 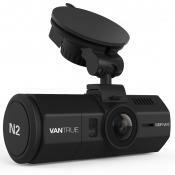 Need a budget-friendly mirror dashcam? TOGUARD offers you an extra-cheap yet extra-stylish backup camera that will catch every moment in high-resolution video format. It can simultaneously record Full HD 1080P front view videos and 480P rear videos, delivering you the best footage anytime. The front camera has a 170° wide-angle lens, whereas the rear dash cam has a 120° lens to keep your car's safety from any side. And if for some reason you don’t want to hook up the rear camera, the front cam will still work. Probably the main selling point of this camera is its large display. 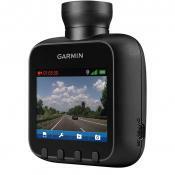 It really offers one of the widest screens for dash cams on the market. The videos will be displayed on the 7-inch IPS screen. So if you want a large, clear display, then this one may be a smart choice. 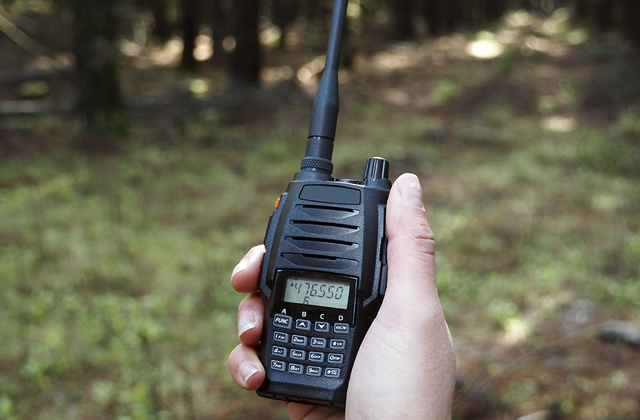 The screen is touch sensitive, very responsive, and easy to navigate. It has a one-key switching design, meaning you can quickly switch the five viewing modes with a single button. After turning off the display, the unit turns into a rear-view mirror. Boasting 2.5D advanced anti-glare glass mirror, it performs even better than regular mirrors. 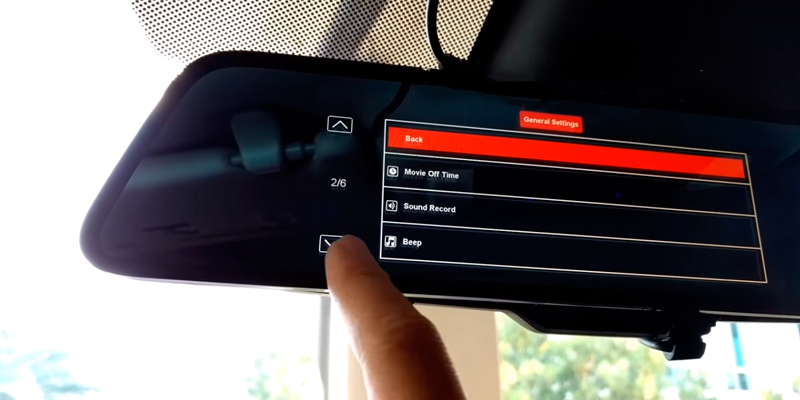 Though you can use a front camera alone, we highly recommend you to connect the rear-view cam as well, since it can extend the possibilities of the unit significantly. To begin with, the rear camera can be switched to the full screen once you’re reversing. 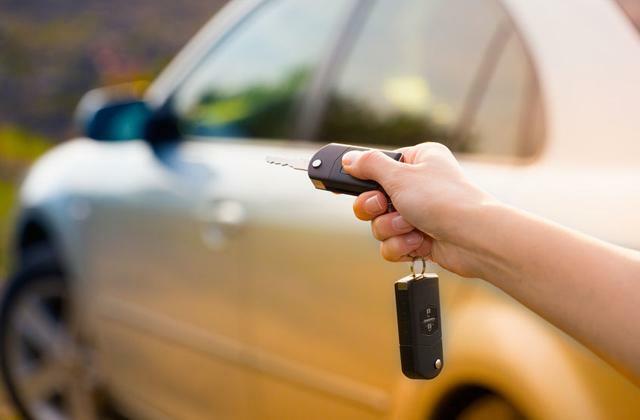 Moreover, it will trigger the guideline for safe parking when your vehicle is in reverse. You won’t even need to turn around. Another ace up its sleeve is the G-sensor that can automatically begin recording front and rear videos in case your car is bumped. Then, the unit will lock this video file and save it. Even if you activate the Loop Record function, it will not overwrite the important files. 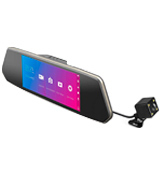 This rear-view mirror dash cam also features the Parking Monitor - it’ll use the power of the built-in battery and record for 30 seconds after detecting a shock or vibration, if your car is being parked. And when the car engine is on, it can record for 10 seconds after detecting a motion. The rear camera is completely waterproof and easy to install. 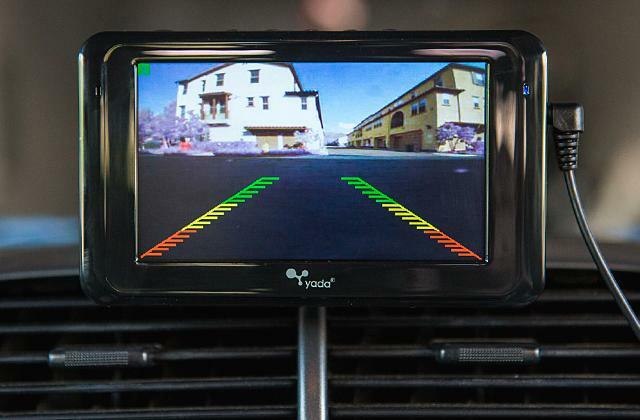 Overall, if you’re one of those who have some troubles with parking, this helpful backup camera might be the best option for you. 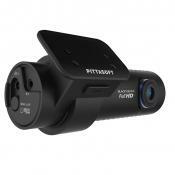 The Pruveeo D700 is another good-quality HD rear-view mirror dash cam that comes at a very affordable price tag. 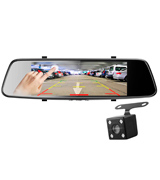 For less than $60, you can get decent rearview and dash cameras that can prove your innocence in case of an accident and increase your safety when you’re reversing. It’s capable of displaying both video streams simultaneously, so you can watch them in the picture-in-picture display. 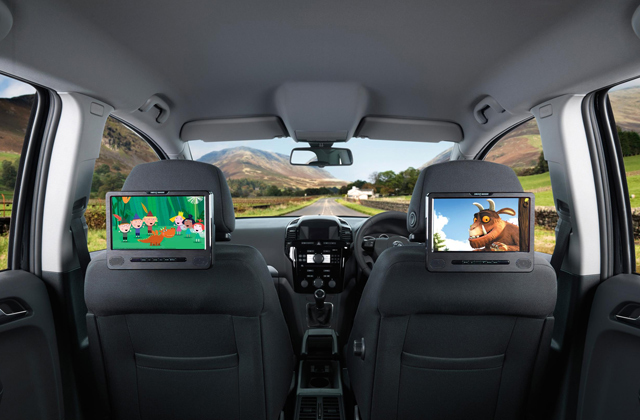 But if you wish, you can always switch to the full-screen display or front /rear view. The display is as large as 7 inches to deliver you highly-detailed pictures. 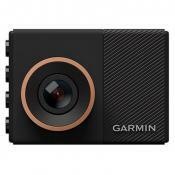 The front camera has a 150-degree angle lens and can record videos in 1080P resolution. Of course, the video quality of the rear camera isn’t that high - the clarity is a bit grainy. Still, it’s quite enough for the reverse motion. And when the R gear is engaged, the unit will automatically display the parking image in the full view. Although the video feed takes up the entire screen, you will be able to focus your eyes so as to disregard the video feed. The mirror is clear and not tinted. It’s also worth mentioning that the camera has no G-shock sensor and can’t lock important videos automatically, yet you can do it manually from the touchscreen. If you’re a kind of a person who doesn’t want to pay an arm and leg for ultra-sophisticated cameras, this is a good investment. The camera comes with everything you’ll need for easy installation - a 19-ft rear camera extension cable, 12-ft in-car charging cable, and a detailed manual. The only thing you won’t find in the box is an SD card. So, if you would like to use it right out-of-the-box, it’s better to purchase the card beforehand. Since the Full HD videos do eat up storage rather fast, we recommend you to purchase 32GB micro SD Card (the max allowed capacity). The camera itself is very easy to set up. It simply fits over your original rear-view mirror. However, a time-consuming part is unavoidable. You’ll need to run the connectivity cables behind trim inside your vehicle. To get all the wiring hidden, you’ll need about 90 minutes. But if you’re not a perfectionist and don't care about exposed wires, the installation can be done in 5 minutes. The Official HD Mirror Cam has quite a lot going for it, even though it doesn't record Full HD video. 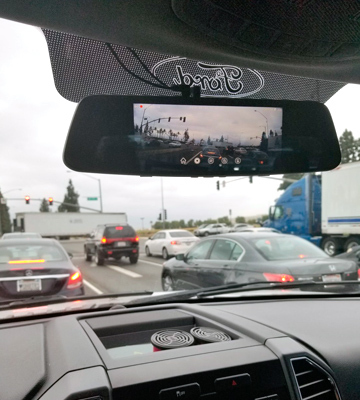 What it somewhat lacks in the quality of recorded footage, it more than makes up for it by its ability to record in the radius of 360 degrees allowing you to see what's happening both outside and inside your vehicle. Besides, most customers acknowledge that the 720P is sufficient enough to see all details, so the camera has all the markings for becoming your "eyes" on the road, saving you from insurance claims, legal bills, fights, and lawsuits, if you're being innocent. Now, let's say a few words about how this mirror cam works. All is simple, really. The camera starts recording automatically once you start the ignition and stops recording the moment you turn the ignition off. 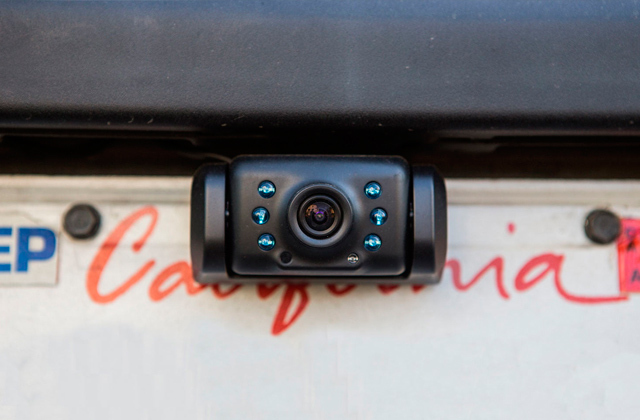 Plus, like a majority of HD cameras, this one has a motion detection function that allows you to record accidents, should one happen when you're being away from your car. All video files are stored on a micro SD card and can be easily uploaded to your computer via a standard USB port. What's notable is that you can also use the One-Touch Photo Snap function to snap photos of objects around your vehicle, which may come in handy if, say, you need to take a pic of a car's license plate in front of you. The unit has a built-in 2.5” LCD screen for playback. Owing to the Ambient Light Sensor, the display is automatically adjusted according to the ambient light to deliver you a crystal-clear view under any conditions. 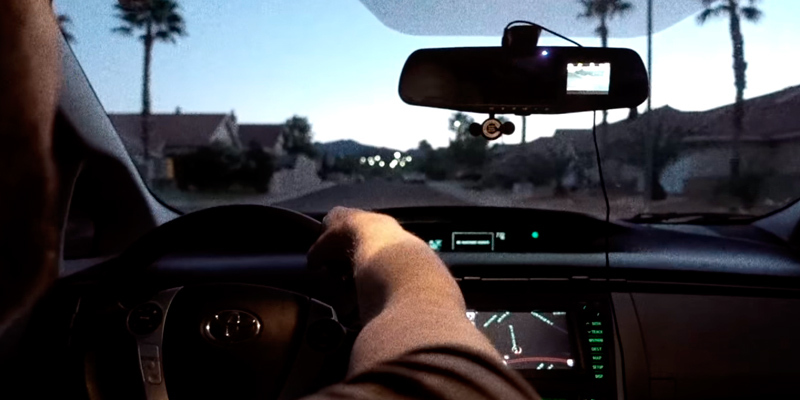 Also, the camera features Night Vision LED that provide enough clarity for night driving. For the price, you really get a bit more than expected. 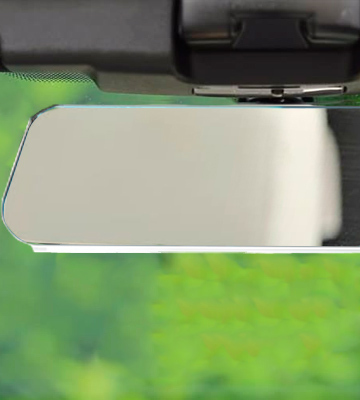 The HD Mirror Cam boasts an extremely simple installation. 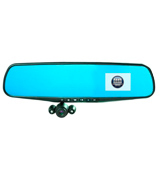 It has the durable rubber strap bands and can be securely installed right over the top of your existing rear-view mirror. Then, you should merely plug it into a 12-Volt outlet, hide the wires using the included tips, and insert a micro SD card. That’s all. 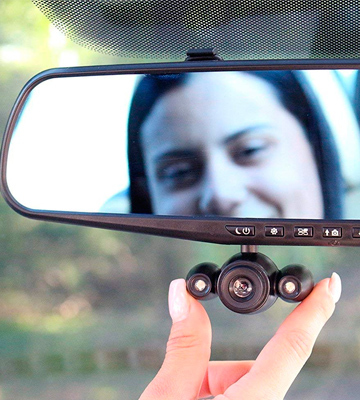 The HD Mirror Cam will automatically start recording once you start your vehicle. It has no rear cam, which means it has no extra wiring to hide. The product also has its own battery that requires no replacing through the lifetime. The battery can operate up to 60 minutes autonomously. What Is an HD Mirror Camera? If the high resolution and ease of use are the number one priorities for you, the HD in-car camera is exactly what you need. HD Mirror Cameras are extremely useful and simple in use. 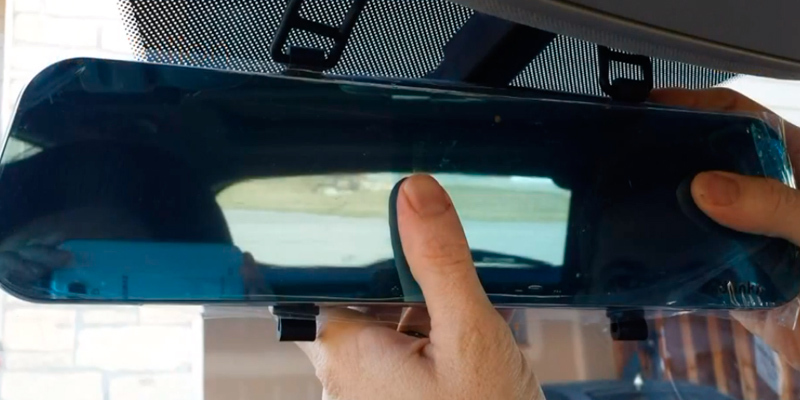 They come with flexible bands and can be installed over your existing rear-view mirror in a matter of seconds. They are 2-in-1 (sometimes even 3-in-1 ) devices that can serve as a front camera, rear camera for backing up, and a simple rear-view mirror. 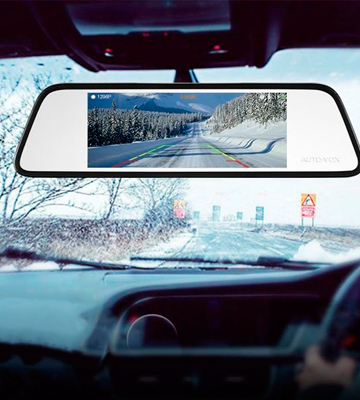 An HD mirror cam looks like a standard car rear-view mirror but features a built-in camera that is able to record the road in front of you. Also, some models come with rear cameras that can show you everything what's happening behind your car. 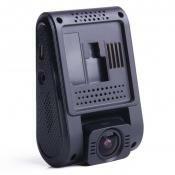 The videos are neatly displayed on a small LCD screen without obstructing your view. If you wish, you can turn off the screen to see the full mirror, while the camera will still record high definition videos. 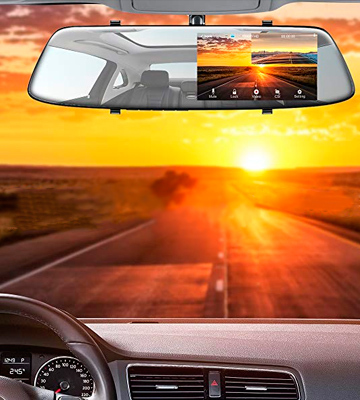 So, if you need an inconspicuous road recorder and a large rear-view mirror at the same time, choose one of the best HD mirror cameras and have a peace of mind on any road trip. 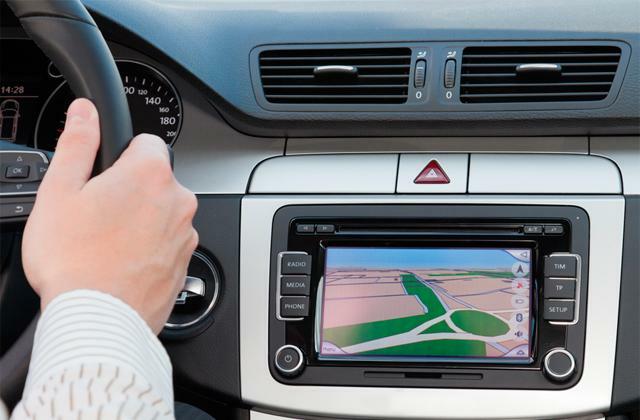 A Car GPS navigation system is another useful device designed to prevent road hazards. 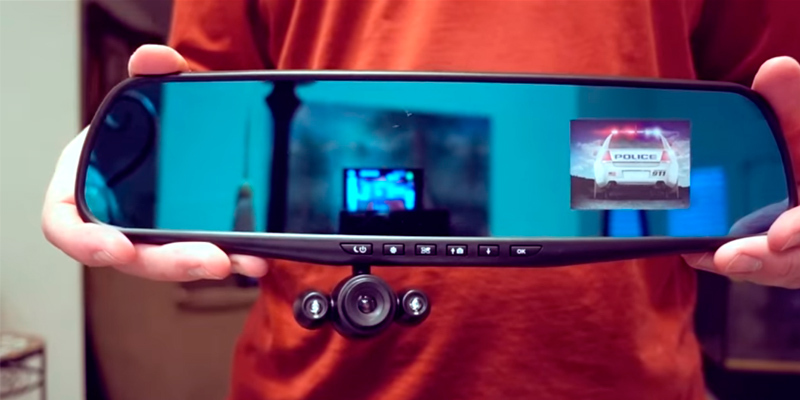 When choosing an HD mirror cam for your car, you should primarily consider its performance. If you need a simple camera for recording what's happening in front of you, you can consider cheap models with a front camera only. However, if you want the maximum functionality, it's better to opt for models that come equipped with both front and rear cameras. Such models can also double as car backup cameras making it safer for you to park in crowded areas. Another essential thing to consider is the quality of video. The better the resolution is, the better the video output will be. Grainy videos will be almost useless in accident claims. So, it's better to look for cameras (both front and rear) designed to shoot in high-definition formats. 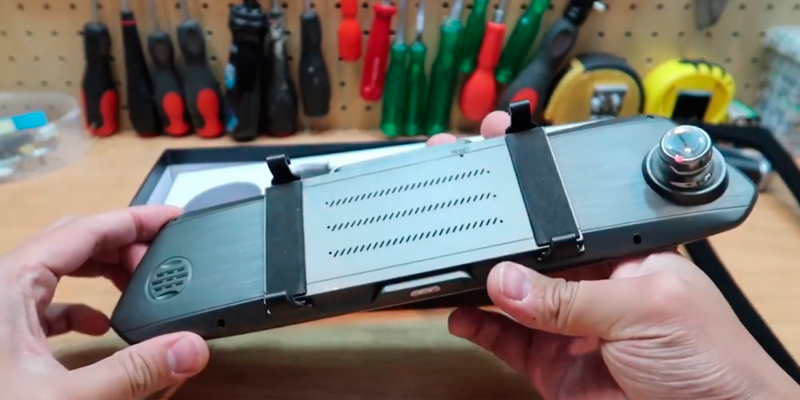 Storage capacity is also a very important aspect, since it defines how many cam records you'll be able to get before transferring them to your computer if need be. Agree, it's not a perfect scenario if you get too little footage from your in-car cam. The size of your HD mirror cam is also worth taking into account. Whereas most cameras of this type have similar overall dimensions, they have different screens. Some cameras can display both front and rear video streams simultaneously in the picture-in-picture display. Also, they allow you to switch between the full-screen display as well as front or rear view. This way, if you're going to look at the display frequently, choose models with large displays. However, if you need a camera to keep on the safe side, you're likely to use it as a mirror mostly. In this situation, the size of the LCD screen won't be so crucial. Loop Recording. This function allows the camera to overwrite the old footage once the SD card is full. This way, you'll never miss any important moment. G-sensor. 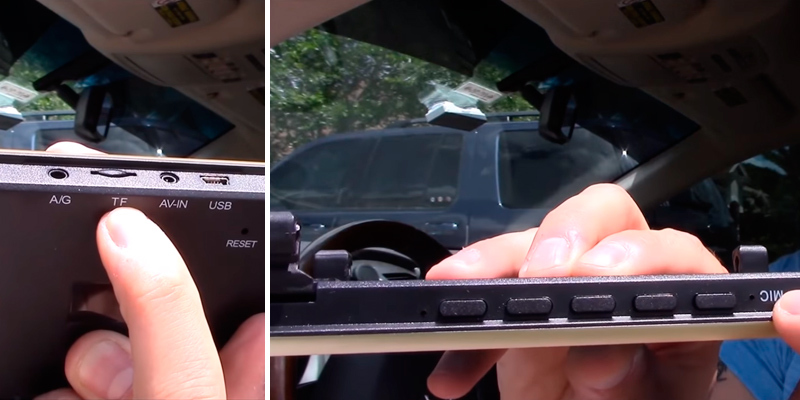 A gravity sensor activates the camera automatically if your car is involved in a crash. The video recording will be locked-in immediately and won't be overwritten. Parking mode. 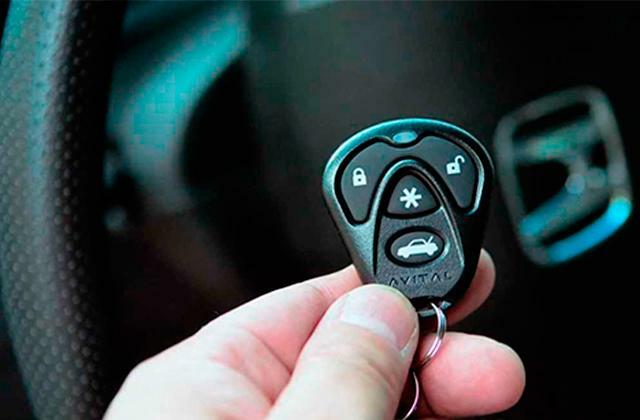 This is a great feature that can protect your parked vehicle from vandals and theft. The camera will automatically start recording once it detects a motion within its detection range. Lane Departure Warning System (LDWS). It's a super-useful addition for those who travel long distances. 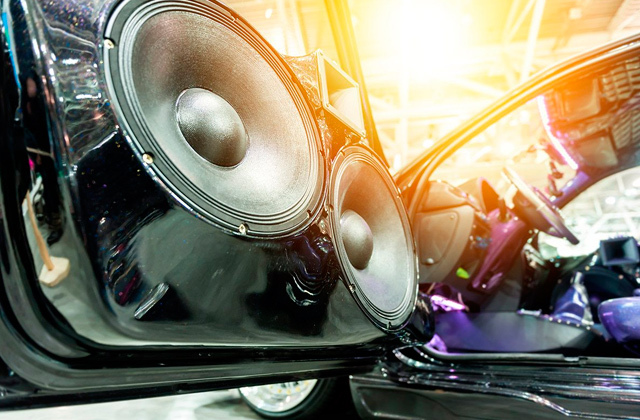 If your car is veering into another lane, you'll get a loud sound alert to be aware of the potential danger. The US is one of the busiest countries in terms of road traffic and no wonder it has the second largest passenger vehicle market in the world. According to the Bureau of Transportation Statistics, the overall number of registered vehicles reached 263.6 million in 2015. Most of the vehicles are passenger vehicles. The car industry is huge and in the same 2015, more than 1.2 billion cars were on the road all around the globe. And the number of vehicles is constantly growing. By 2035, the record number of 2 billion is expected to be beaten. Unfortunately, the high level of traffic is the reason leading to more traffic accidents. For example, in the US alone, there are more than 6 million road accidents per year. And this number includes both fatal and injury crashes. The Benefits of In-car Cameras? 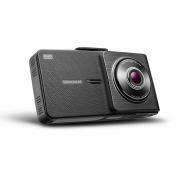 Several years ago, in-car cameras were not as popular as they are today. You could see dashboard or mirror car cameras mostly in racing. In-car cameras were used to provide thrilling footage and to analyze crash situations. Also, dash cameras were also popular with police. 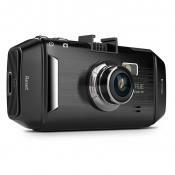 Today, dash cams become more and more popular among drivers, since they can bring people numerous legal benefits. 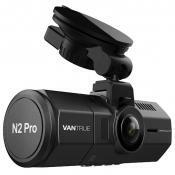 Dash cameras can help you prevent frivolous liability defenses when another driver is faulty. While insurance companies might use different ploys to deflect liability from you in order to save money on fixing your car, a dash cam footage can easily refute those ploys. Besides recording the moment and the mechanics of an accident, a mirror camera can also estimate the severity of a crash. Some models feature accelerometers that are capable of measuring the force of an impact. This way, insurance companies won’t be able to state that it was a simple ‘bump’ rather than a serious collision. Actually, a car camera is a flawless product that almost has no downsides. Some states prohibit making audio recordings without a person’s consent. However, only a few mirror cams include in-car audio that, luckily, can be switched off anytime. Yet, to be certain that your recordings are completely legal, check your local laws in advance. The first backup was introduced in January 1956. It was embedded in the Buick Centurion concept car. The car had a rear-mounted camera which sent images to the screen in the dashboard. However, since it was only a concept car, the idea of backup cameras wasn’t introduced to the mass market. It was not until 1972 that the Volvo company equipped their Experimental Safety Car and Volvo 240 model with a backup camera. Later, in 1991, Toyota released the first production vehicle to incorporate a backup camera. 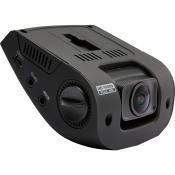 It was designed with a color EMV screen and a rear CCD camera. The camera had to be mounted on a spoiler.